It is possible that I have a predestined relationship with Bluelight Eight-Diagram Therapeutic Apparatus. I found a radio in them when I was arranging the drawers of the desk on a day in this February. I turned it on and I just listened to the “Voice of Bluelight” lecture. Much feedback information from the beneficiaries of Bluelight Eight-Diagram Therapeutic Apparatus attracted me through Professor Zhou’s vivid description. I sat down and listened to the lecture until it was finished, and I got to know it is a domestic therapeutic apparatus which can dredge human channels and activate human potential. The diseases which can be treated by Chinese medicine can be treated by it. And it is safe and painless without any side effects. Anyone can use it at any time without the expensive cost for the treatment in hospital. In the following days, I turned on the radio punctually at 4-5 p.m. every afternoon for listening to the lectures. Why am I so interested in “Voice of Bluelight”? I was born in 1949, and my physique was very weak because my mother couldn’t feed me at the breast because of tuberculosis and could only send me to my uncle’s home in the country for drinking rice-water. I have suffered from many diseases since the childhood, and I once received a notice of critical illness. I encountered the Three Year Famine when growing up and I went to the country for labor when I just became a grown-up. I suffered from omarthritis, sciatica, pharyngitis, oral ulcers, unreasoned dizziness, cold, sinusitis, stomach pain, hyperthyroidism as well as systemic arthrosis and hypertension in recent years. All in all I had been tortured by the diseases for many days. I always blamed and censured myself why I had such bad luck. There was even an idea of death flashing in my heart. It made the situation worse that my enterprise had gone bankrupt as I became old, there was no basic welfare with only 150 yuan per month for making living. From the December of 2005, my left arm felt a dull pain, and it became intolerable in January. I couldn’t lift it or swing it outward and backward. It was very hard to put on clothes, and it often made me in a cold sweat. For example, one day I subconsciously pulled the curtain to make the arm in traction, the pain broke the tears in my eyes and I couldn’t breathe for a while. I couldn’t wear an apron every time I cooked meals. I couldn’t bear such a situation any longer, I thought my left arm was disabled, then I intended to go to hospital for treatment. I knew that I needed to spend a lot of money on the treatment and it could stimulate the stomach severely. Well, no choice! It brought the light of hope of curing the disease that I could listen to the Voice of Bluelight. There is a popular saying “You could have anything but illness; you could have nothing but money”. I have illness but have no money. 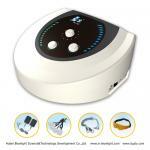 It satisfies me a lot that Bluelight Eight-Diagram Therapeutic Apparatus can just solve my problem. The February 19th is a sunny Sunday, I came to the headquarters of Bluelight. I saw many new and old friends consult and communicate here. An old man told me that he has bought two sets of Bluelight Eight-Diagram Therapeutic Apparatus whose effect was really good, and he came to buy a set for his son. I saw they finish the try of the apparatus. The staff introduced the performance of the apparatus in details then and treated on my painful parts with it for a try on the spot; I felt very fresh and cool. By observing and hearing for several hours, I thought twice and decided to buy it. It was funny I didn’t take any money on me, but I borrowed it from friends immediately. Then, I brought a Bluelight “Yidiantong”.